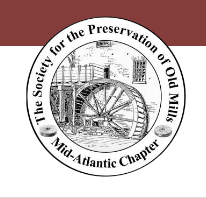 Founded in 2004 the Mid-Atlantic Chapter focuses on the mills in Delaware, Maryland, Pennsylvania, Virginia, and the District of Columbia. Our mission is to promote the preservation of and historical research on the mills of the region through education and fellowship. We seek to provide a database of mill locations, photos and historical information of the mills of the region. We hold a spring and a fall meeting with tours of old mills and other activities of interest to members.